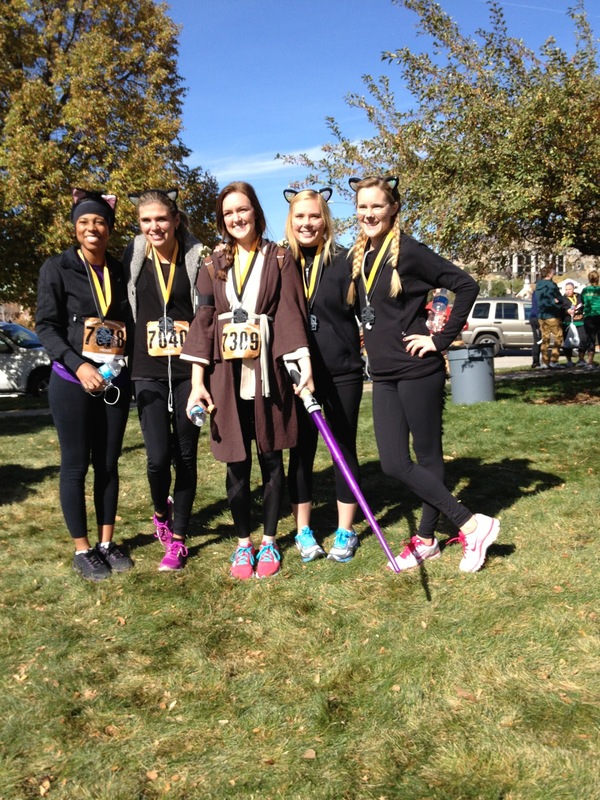 yesterday was the halloween 1/2 marathon! it went from sundance resort down to the riverwoods mall. i think this was probably the hardest race i've ever done. it was so incredibly cold, m bones were completely frozen & stiff. we waited outside for well over an hour in the low 20 degree weather to go on the shuttle that would take us to the race start...where we would then wait another hour. but at least at that point we got to wait in a tent! shayla, brittany, beth & grace also all ran the race too, so it was fun having them all there! the first 4 miles went great & easy, but it was after those that it was semi downhill for me! beth, brittany & i decided to give ourselves a break & walk a little bit. which turned into the majority of the race. i'm going to blame it on the cold. but maybe i'm really just lazy haha. either way, i did have fun with the girls & now that the race is over, i'm happy i did it. all though i really don't think i'll sign up for another one any time soon! all of the girls did so well too, & it was fun having friends there to watch us cross the finish line! after the race austin, ashley, brittany & i went to dennys to re-fuel. i was completely starving & it was exactly what i needed! after denny's austin went fishing & ashley, brittany & i went to see pitch perfect. it was a pretty funny, pretty cheesy movie. but i liked it! beth, grace, brittany, shayla & i! You're so cute! I wish I had the energy to run a half marathon. I love running, but I would probably be in a coma now had I done this. haha! We still need to hang out real soon.